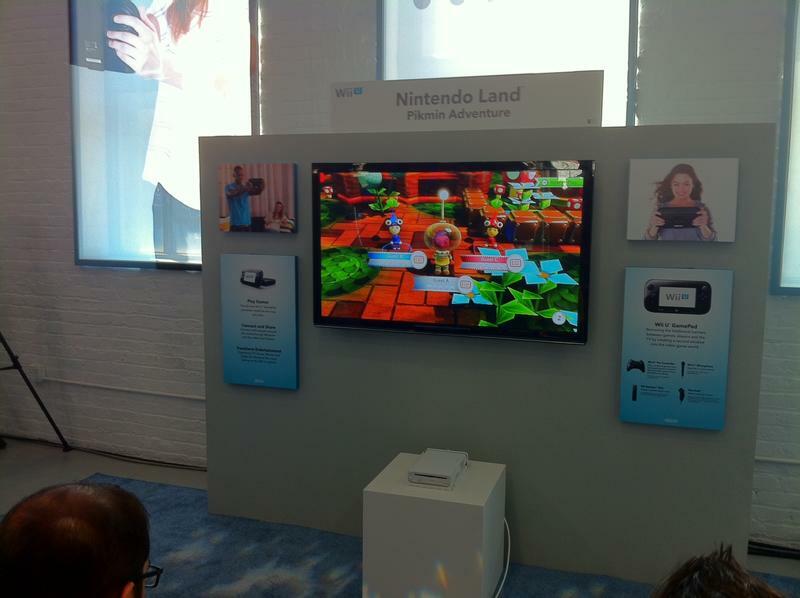 Nintendo Land is one of Nintendo's biggest software efforts for the Wii U. The title is a virtual theme park done up in a Nintendo theme. Players will be able to explore Nintendo Land itself, buy objects for the park and enjoy whole attractions. The attractions are actually games, or mini-games in some cases. Each game is meant to show off how players will be able to make use of the GamePad and Wii Remote combination. Honestly, think of it like Wii Sports for the Wii. It's a collection of deceptively deep games built around demonstrating the console. Now that the description is out of the way (and, trust me, you're going to read it more than once as I dive into pieces of the Nintendo Land puzzle), here's my take on Pikmin Adventure. A new take on an old challenge. In Pikmin Adventure, players will either play as Pikmin (with the ability to jump and attack) or a Captain Olimar-esque commander (with the ability to grab every player at once and throw smaller Pikmin). The Captain plays with the GamePad, and the Pikmin play with the Wii Remotes. The title supports anywhere from one to five players at once. Rather than micro-managing a massive squad of Pikmin, Pikmin Adventure is a game that essentially has players stomping through levels in old school hack 'n slash style. This is a healthy serving of addicting action with very light blasts of strategy. You'll move through whole levels at a time (we only played the first and second), defeat groups of enemies, find extra goodies and take on a final boss in order to proceed through what appears to be a decently sized campaign. There is a leveling system in place, as well. Honestly, this was the single point of the experince that made me think, "yes, I will play Pikmin Adventure more than once." You level up as you collect bits of nectar that drop from plants and enemies. The more you level, the higher amount of damage you can deal with your attacks. As bigger and bigger numbers pour out of enemies, the game becomes more and more addictive. That's when the attraction suddenly gained a nice measure of depth. Pikmin Adventure is more than just a fast mini-game. It's a game that I genuinely think I'll want to play again and again with as many friends as I can. Nintendo hosted a preview event for a ton of titles after their presser in New York City on September 13th. We made our way downstairs and went hand-on with as many titles as we could muster. This is a piece of our preview coverage from the event.